In many cultures, chai simply means tea. 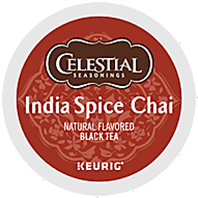 Celestial Seasonings Original India Spice Chai Tea is blended from premium teas combined with natural spices and exotic flavors. Sweeten with sugar or honey, then add milk or your favorite substitute. Enjoy the health benefits of antioxidant-rich tea and spices, and savor the intriguing taste that stands apart from the crowd.